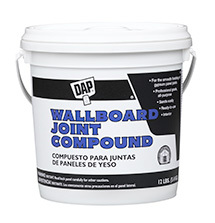 A pre-mixed, professional grade compound for taping, finishing and texturing interior gypsum wallboard. It can be used to cover and finish gypsum wallboard joints, embed reinforcing tape, metal corner beads, screw or nail holes. It is easy to apply, has minimal shrinkage and sands easily.